Retina display, schmetina display. LG has unveiled a new five-inch display that may very well burn the eye balls right out of your head. LG announced a new five-inch display this morning that could give Apple's Retina Display a real run for its money. The new LCD panel is based on AH-IPS (Advanced High Performance In-Plane Switching) technology and clocks in at 1920×1080, which means it will be pushing 1080p resolution. It has a 16:9 widescreen aspect ratio and will boast 440 pixels per inch (ppi). To put that in perspective, the iPhone 4S Retina Display is 3.5-inches at 960×640 and has 326ppi. While we hear about lots of new display technologies, it always seems like we'll have to wait an eternity for them to make the way to our phones. That isn't the case this time around as LG is saying we expect to see it in the second half of this year. You can check out more details on the new mobile high definition display in the press release below. LG Display's 5″ Full HD LCD panel is a step forward past existing mobile display technology. The LCD panel based on AH-IPS (Advanced High Performance In-Plane Switching) technology features 440ppi and 1920×1080 resolution, providing for the first time Full HDTV quality on a smartphone. With 16:9 widescreen aspect ratio, the panel is also 0.5 inches larger, 2.2 times denser in pixels, and 1.3 times more advanced in ppi than the preceding 4.5″ panel at 329ppi and 1280×720. "As smartphones become increasingly valued for how well they do multimedia and with the rapid growth of LTE enabling faster large file transfers, our new 5″ Full HD LCD panel is certain to prove a significant asset to the mobile market," said Sang-Deok Yeo, CTO and Executive Vice President of LG Display. "With the world's highest resolution smartphone display, LG Display continues to remain a step ahead in developing the most innovative in display technology products." 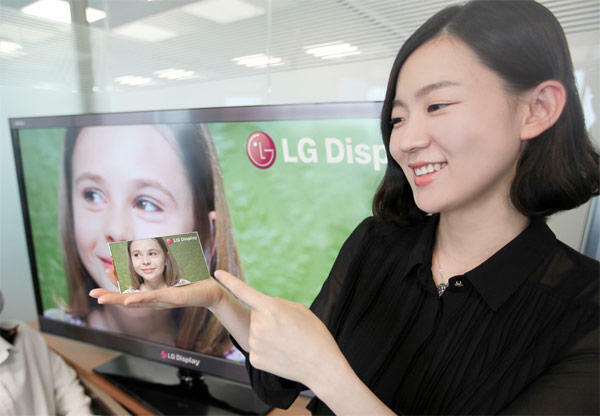 The display solution of choice for smart devices, LG Display's AH-IPS is the technology behind the new Full HD LCD display. With the high density of AH-IPS, the naked eye is unable to distinguish between individual pixels. AH-IPS panels also express the original color of images highly precisely, and feature a wide viewing angle as well as stable display image and rapid response speed when touched. Finally, with its brighter light transmission and lower power consumption, AH-IPS is ideal for use in outdoor settings.